Now at this point everyone on the boat had thought I had lost my mind. Maybe the old TV show host had a little too much shine while up in mountains. I laid out about fifty feet of line all the while these Spadefish were swimming by us like we were all at a swim meet or something. Within about 45 minutes we had limited out on Spadefish and no one else around the tower area and done much of anything. The trick is this. Sometimes it takes a sensitive presentation that is about as simple as it can get. Be patient, and you will get the hook up. I have seen times when a Spade fish will swim up to even just a small split shot, get spooked, turn around and swim away. I have seen this many times. Now, if the fish are in a feeding frenzy when you first arrive to your spot, just reach down and grab one, they are that easy to catch. BUT, if they have lock jaw, downsize everything including rod, reel, line, bait, and don’t put anything in the water that will spook them including chum. Once the bite turns on, start chumming again and it will attract other fish. Skip the Chesapeake Light Tower and fish the artificial reef surrounding it. There is so much structure out there it is unreal. THAT is where the fish are! 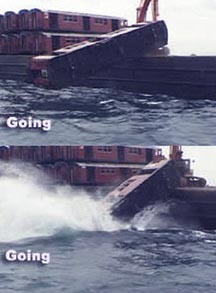 Some years ago we filmed the sinking of the Redbirds, train cars that were sunk as a part of the artificial reef program by the VMRC. 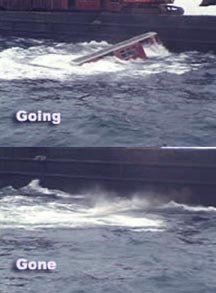 I saved some of the GPS numbers during the sinking and have posted them over on our HOOKED page. Mike Meyer from the VMRC gave me permission to re post their GPS chart of the entire reef area. FANTASTIC RESOURCE!! If you have not checked it out, please do. Just scroll to the bottom of the page. I also put an excerpt from “The King Of The Sea” this was a part of our offshore White Marlin excursion that is in the book HOOKED. Filmed out of Hatteras NC, This was a wild ride! Try these numbers and check out the reef chart. Here are some other things to check out. Suzuki Outboards is working with us on some promotions and they have a new Facebook Page, on FB just search Suzuki Outboards, everything we are doing will be there or on our Jim Baugh FB Page. We have some cool giveaways coming up so check it out. Come meet all of us at Victorian Station for drinks, food, music, and THREE authors signing books. It is going to be one fun evening and we really would like everyone to come out and swap fishing stories, recipes, and enjoy the music. All the info, directions etc is at the link below. It is free and is open to the public. This one cannot be anymore simple. First, get some fresh Spadefish and filet them up, and no bones about it. Clean the meat very well and strip out that small red line down the back. Soak the filets in a mixture of four cups of milk and 1\2 cup of Cajun seasoning. Let sit for a couple of hours. 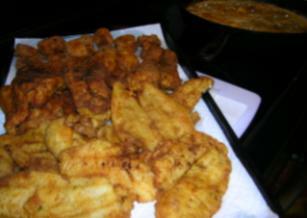 Then bread them in your favorite Cajun batter and pan fry in a cast iron skillet. Squeeze fresh lemons on top of the filets once patted dry. Serve with a variety of sauces including tarter, BBQ, and remoulade. Your friends and neighbors will love you! 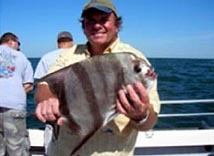 Now get HOOKED on Spadefish today!